Xpedite Technologies approach to providing highly skilled IT professionals is best demonstrated by its seasoned recruiting department. We have taken today's critical skills and classified them into vertical markets. The following list is just a small sampling of technologies to that our consultants are exposed to. The forte of Xpedite Technologies service is our ability to provide the most difficult to find skill sets and technologies. Xpedite team has exclusive technical know-how in providing effective IT services to extend quality services and comply with corporate values. Our team is focused with domain acumen, agilest in taking business decisions and upholding total responsibility. Our core management team consists of thought leaders with many years of diverse experience and a proven track record. Blended with business service expertise and technical knowledge, they guide our other teams to craft innovative IT services and solutions for valued customers. 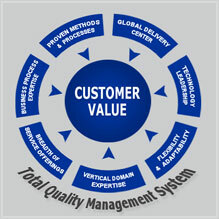 They enable us to foray into diverse industry verticals to offer industry driven IT services. In-depth design utility skill using UML, OOSE, Rational Rose, etc. Xpedite, from its inception, has been built on internationally recognized standards of quality. We have combined well-defined processes, procedures, and standards with active measurement and continuous improvement throughout our organization. Our customer engagements for example follow a 10-phase project lifecycle that defines our company’s interactions with our customer at each phase. We follow several well-known system development methodologies including Waterfall Model, Cyclical (Prototyping) Model, and Rapid Development Model depending on the needs of our customer. We have a documented Project Management Method that provides guidelines on planning, organizing, leading, controlling and completing projects. We have procedure documentation that defines specific activities, the roles and responsibilities associated with those activities, and the inputs and outputs required for each those defined activities. Xpedite has invested the time and resources into seldom used but highly important programs for disaster recovery, business continuity, and security. Our methods and processes are institutionalized throughout the organization using mentorship and training programs as part of our commitment to consistency.